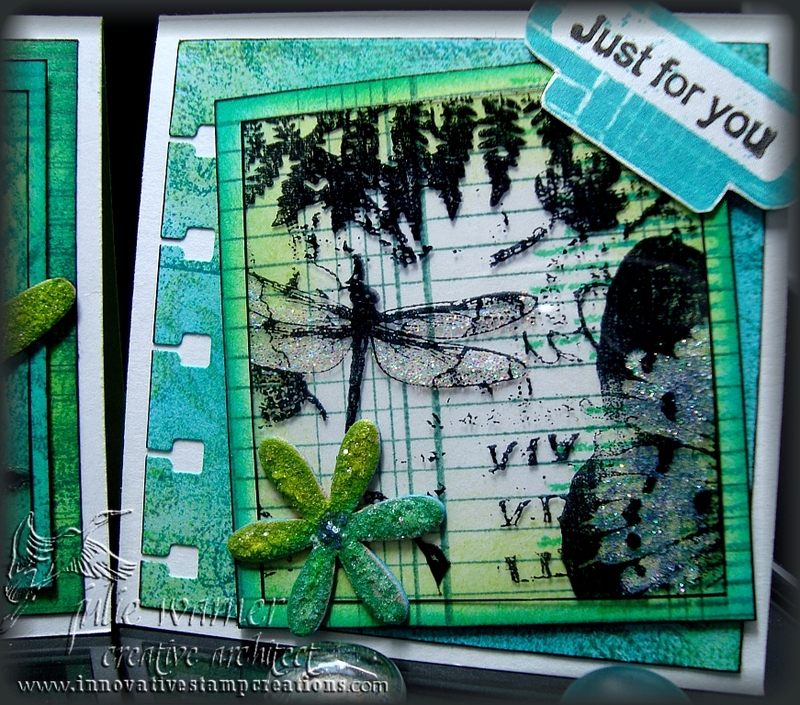 Super color combo challenge (CC341) today at Splitcoast! I chose to use them in small doses on a mostly white card. I needed a bday card and I wanted it to be fun and colorful and I think this will fit the bill. 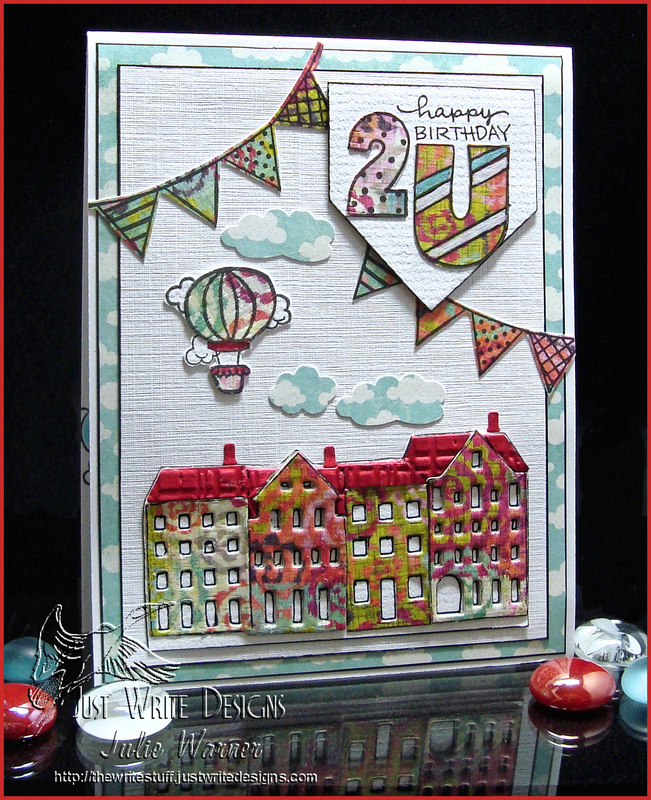 The row houses were die cut out of the BG dp w/ a little red for the roof. I added just a bit of texture to it then traced around the window openings w/ a Micro pen. 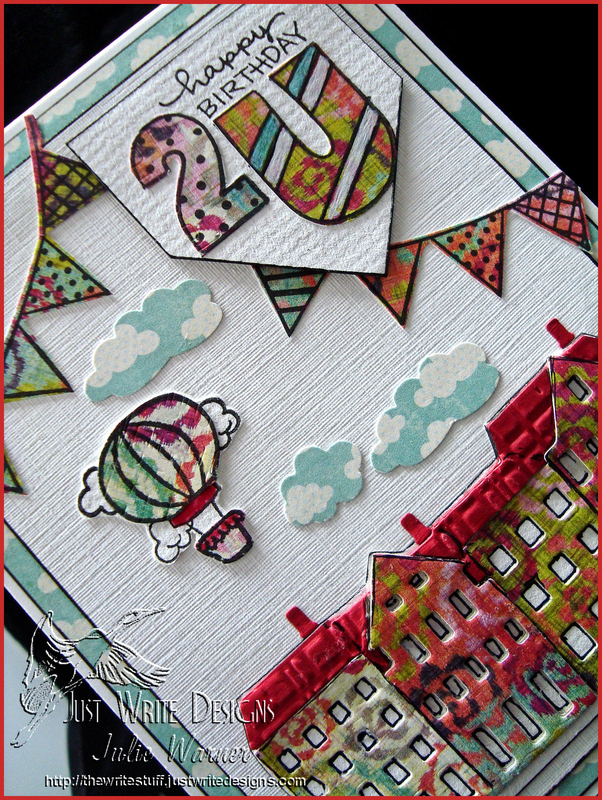 The the little hot air balloon and sentiment were paper pieced using some of the same dp as the houses. The clouds were punched out of the cloud dp I used for the next layer. I hand cut the sentiment into a banner shape and added the little cut out banners across the sky. The finished card is 4.25 x 5.5. Almost forgot. I’m adding this to the Moxie Fab Tuesday Trigger. Today, I thought I’d try something different. Focus on something I made a while back but for some reason, never made to Splitcoast. The challenge today is Mostly Blue for F4A82. This line is ideal for Artist Trading Cards, when you need a quick Mini-Card! Even accents the pages on a small Mini Book too! The tab image is super easy to use as you’ll see in the sample below you can use almost any of the phrases on the inside of the tab to accent your card, etc! I made a trio of little mini cards using a technique similar to the one Here. I kept the same general layout and colors for my set of 3×3 mini cards. The main images were stamped with Stazon onto acetate and stickles was added to the back side. The acetate was then attached to the backgrounds which were mad by stamping various elements of the Mini Ledger set and sponging ink around the edges. The notebook edge was done with a spiral punch. The tabs were inked then pressed against the mini ledger ( Kissing Technique) before stamping onto white card stock. This gives just a hint of the lines. The sentiment was then stamped in black inside the tab. The little chipboard hearts and flower were first pressed against the Kpad (for color) then stickles was added on top. Finished mini cards measure 3 x 3. 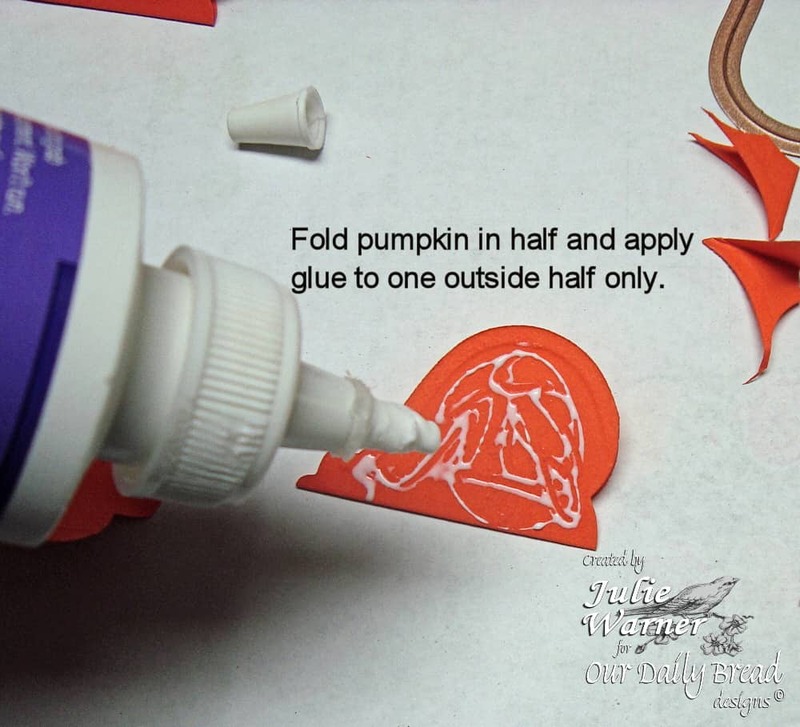 I have a special post over on the ODBD Blog today with a mini tutorial on how to create these cute little pumpkins. And here it is on my blog. Fall is almost here! 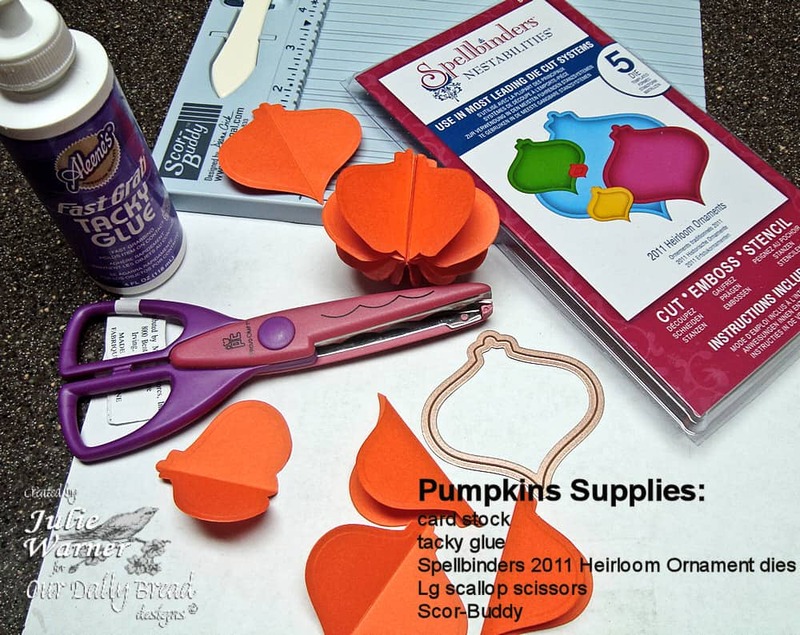 I have a little project for you today involving pumpkins. You know it’s fall when you see pumpkins on display! 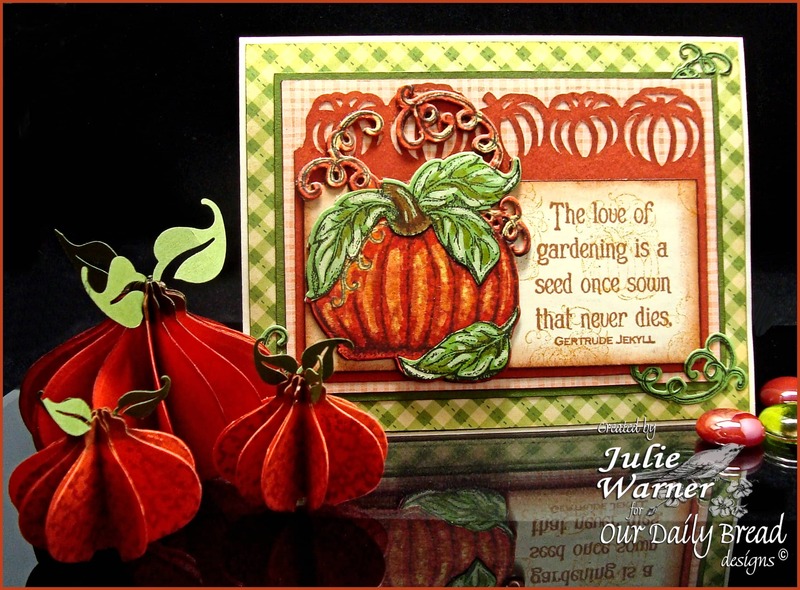 I also have pumpkin card to show you, made with the fabulous new ODBD pumpkin image and matching custom die. 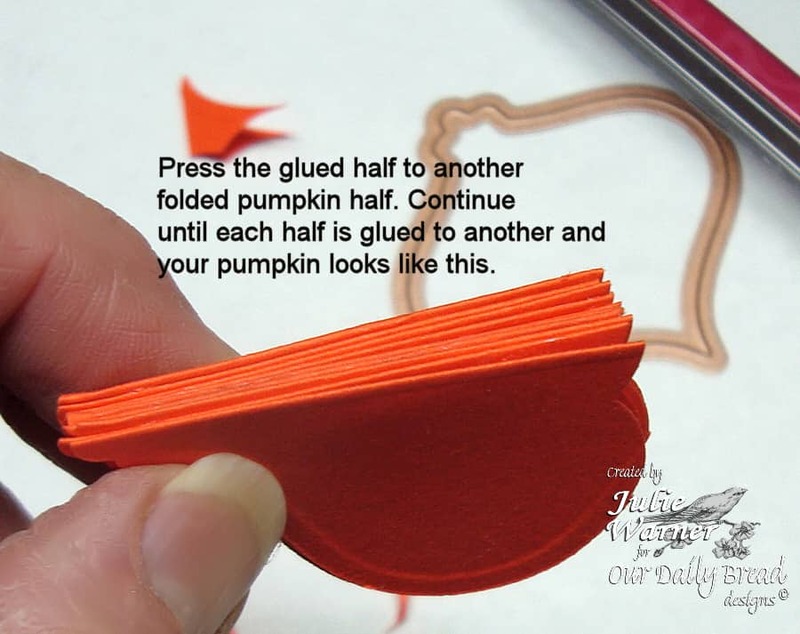 I had the idea of making the little accordion pumpkins but I started to use a circle or scallop circle die. Luckily, I had just received the brand new Spellbinders 2011 Heirloom Ornament dies and I thought if I trimmed the pointy bottom, the shape really looked like a pumpkin. Here’s a little closer view of the pumpkins. 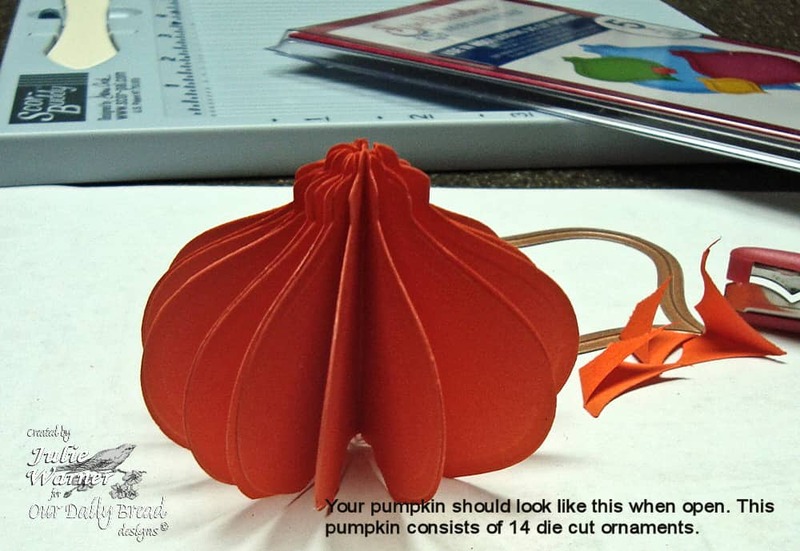 I used the two middle size dies for these pumpkins. These are pretty easy; just follow the instructions on the pics. Remember, just click on each pic to enlarge. 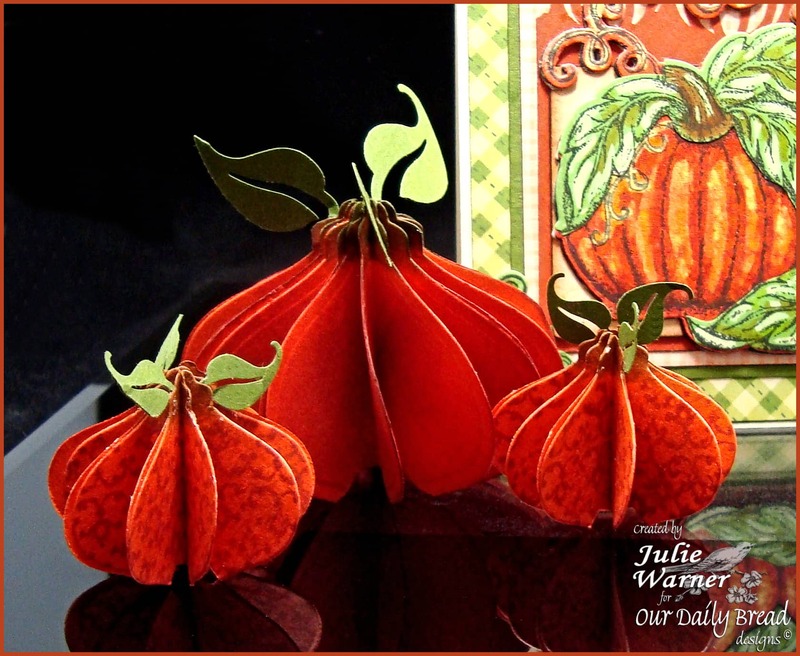 On the two little ones, I stamped the Vintage Border Background with Memento Rhubarb Stalk before I glued the sections together. The leaves were punched and I put a little glue on the stem and stuck them between the sections before I glued them together. I sponged on a little dk green ink on the tops of the pumpkins in order to more resemble a stem. You could glue together the final 2 sections if you want them to remain permanently open, but it’s not necessary. 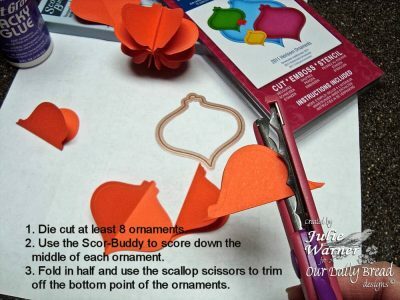 And if you want to mail them, just fold them closed and put a little paper clip on them. These recipe cards were in the dollar bin at my local craft store along with the Seeds tin. I added some stamping on the recipe cards and cut out the pot w/ tools and the little pumpkins from the Garden Tag Set, and attached them on the upper right corners. The recipe cards just fit inside the tin. 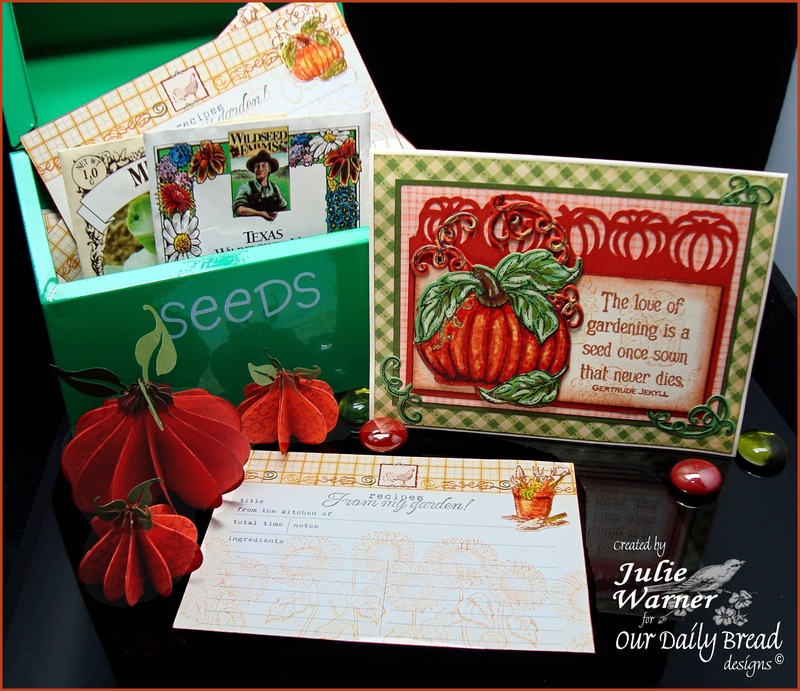 Add a few packets of seeds, and you have a nice little fall gift set for someone special!